Frederick Langloh’s family was the arm of Bonnie William’s family which continued to live and prosper in Tasmania after older brother William Sorell, and younger brother John Bowman and their families emigrated to the mainland State of Victoria in the mid 1850s. To our Tasmanian cousins we are all indebted for the retention of some of the oldest photographs of the entire family – photographs of Margaret Wilson and the Frederick Langloh Wilson line. Most particularly we owe our debt to the late Mrs Madge (Dixon) O’May who kept safe, and to her mother Lillian Langloh (Wilson) Dixon who created, the most magnificent album of family photographs of all in the family. One such page is displayed above – each page in Madge’s album is so adorned with cut out pasted in colour pictures of flowers and birds – an expression of her intense love and respect for all her broad family membership present and past. 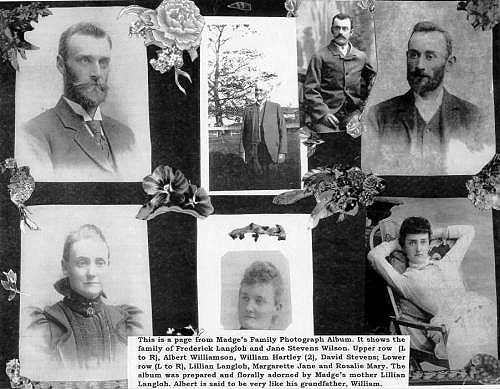 The full colour Feature Image at the top of the page displays – clockwise from left, Madge’s mother Lillian Langloh (Wilson) Dixon, Margaretta Jane and her husband George Boys Albury in their latter years, the two young brothers of Madge O’May (Rex and Leigh), Margaretta Jane (Wilson) Albury, and finally lower centre the elegant Madge (O’May) Dixon. Madge joined our 1995 reunion group in Tasmania for part of the service held at Hestercombe Church and cemetery. She passed on in 1998 and was given the honour by her family of being interred with William & Margaret, and with her grandparents Frederick Langloh and Jane at Hestercombe. A plaque commemorating her passing was affixed to the gravestone above that for her great-grandparents – see below, with another family group image and a 19th century image of Hestercombe. The Set above shows Frederick Langloh Wilson, his wife Jane (Stevens) Wilson, and their respective mothers.